A warm, moist or dry towel is a welcome treat for every client. Whether used in body care, esthetic services or in salon services, these hard working cabinets are a must have. 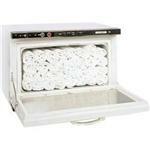 Hot Towel Cabinets, Towel Warmers and Supplies.